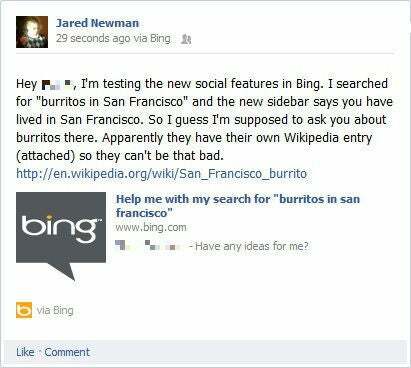 Microsoft's Bing search engine just got a lot more social. A new Bing sidebar, rolling out to all users now, suggests Facebook friends who might know about a given topic, and shows activity from high-profile people on other social networks such as Twitter. The social search results are a direct shot at Google's Search Plus Your World, but they aim to be less intrusive by staying out of core search results. I've been poking around with the new Bing, and I think Microsoft succeeded in adding social search results that don't get on your nerves. Still, Bing has lots of room to improve in the actual results that it serves up. The new Bing lets users ask questions of their Facebook friends from within any search results page, so if you're looking for a place to eat or something to do, you can get advice from friends alongside whatever the search engine spits out. Of course, posting to Facebook from Bing requires you to grant permission from within Facebook. By default, only friends will see your questions from Bing, but you can change this option from the permissions page or from within Facebook's privacy settings. You'll also see an additional permissions page the first time you post, just to clarify that anything you post in Bing will show up in your Facebook Timeline. For any given search, Bing suggests a list of friends who “might know” about that topic, but only by superficially scanning for “Likes,” places of residence and mentions of the keywords you're searching for. I wish Bing drilled a bit deeper, and took a more holistic view of my friends' interests. For example, if I search for “Cincinnati chili,” I don't need a list of everyone who ever lived in Cincinnati. I need to know who on my friends list is the resident foodie, and has at least visited the city. Fortunately, you can also post questions seen by all your Facebook friends, so the right person might answer on his or her own. You can also include links to pages that appear in search results by clicking on the link icons next to each result. I didn't have much luck getting social results from high-profile people, which appear in the sidebar as “People Who Know.” Though a search for “movies” triggered a list of famous Twitter uses such as Roger Ebert and Peter Travers, searches for “music” and “Diablo III” returned nothing. Bing is obviously not digging too deeply into past Tweets. It's only bringing up people who might be experts on a narrow set of topics. That's a problem, because while I'm unlikely to ever search for “movies,” I search for specific films quite often. You won't get any expert results by searching for movie titles. If you're totally against social search, you can minimize the sidebar by clicking the circular arrow button near the top right side of the screen. A small gray strip will still appear on the right side of all search results, and if you've signed into Facebook through Bing, thumbnail icons of suggested friends will still show up on that sidebar. It's worth noting that Google allows you to hide personalized search results completely by clicking the globe icon on the top-right side of the screen. So although the new Bing sidebar isn't as intrusive for those who want to use it on occasion, it's just slightly more of a nuisance for those who have no interest at all.